(Oregon Coast) – It's going to be the be the maddest of all madhouses on the Oregon coast over Labor Day Weekend, as summer's last blast brings out all the vacationers. There's a lot to do and see out on the beaches – but even more than meets the eye. You'll find a full roster of events and happenings in and around these beach towns over the holiday weekend. During the day and at night, there's much to keep you busy and even distracted from the beaches. (Note: you'll want to make lodging reservations now as most spots are already filled up). Through September 10, you can catch the famed play “Shanghaied in Astoria.” The Astor Street Opry Company (ASOC) is now in their 32nd anniversary season of the musical farce about Astoria's ruddy past. Director Nate Bucholz is at the helm, coupled with Carlete Lewis Allen’s choreography, it continues to tickle your funny bone and get your foot stomping. Part-vaudeville, part-soap opera, and part 1950’s style Hollywood musical – all combined into a fun and entertaining look at traditional local cultural folklore, as it brings together many of your favorite finest entertainers west of the Rocky Mountains from over the past 32 years. The show runs every Thursday, Friday, and Saturday. Doors open at 6:30 pm, and the show begins at 7 p,m. Sunday matinees will be at 2 p.m. (doors at 1:30 p.m.). Astor Street Playhouse. 129 W Bond Street. Astoria, Oregon. (503) 325-6104. astorstreetoprycompany.com. From September 2 to September 4, there's the Ham Radio at Fort Clatsop. The American Radio Relay League is helping national parks celebrate their 100th anniversary, and this one happens at the Lewis and Clark National Historical Park just south of Astoria. Ham operators of this club will set up radio stations at the park’s Netul Landing site. The public is invited to come learn about ham radio and even speak through a microphone in a radio conversation with someone a long distance away. Fort Clatsop Visitors Center . 92343 Fort Clatsop Rd. Astoria, Oregon. 503-861-2471 . Take a Guided Canoe Day Trip in Seaside on September 2. 1 pm - 4 pm. There's a lot of canoeing fun along the river and upper estuary system of the Necanicum River confluence. Don’t forget to bring sunscreen, water bottle, and camera. Meet at the boat dock in Broadway Park. Cost to participate is $30 per person, or $20 for resident. 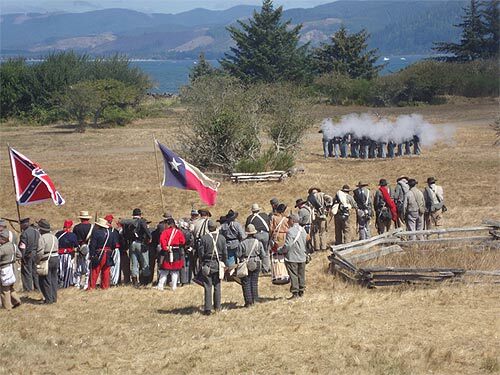 The biggie on the Oregon coast happens September 3 – 5 at Fort Stevens in Warrenton with the huge Civil War Reenactment. It's the 26th year for this grand event, one of the largest of its kind in the northwest region. Infantry, Cavalry, Artillery, Medical Corps, Camp Followers, and Townspeople (sutlers) make up the variety of Civil War period reenactors you’ll encounter. Several live battles are carried out live. Meet President Abraham Lincoln, see a fashion show, listen in on fife and drum practice, stroll through the “village” of tents to admire craftsmen, cooks, and undertakers, and spend the day learning about history first hand from soldiers. There are field artillery demonstrations and see actual cannons fire from up close. Food and drinks available for purchase from Annie’s Kettle Corn. Traders/sutlers general stores offer clothing, toys, and more for purchase. Fort Stevens State Park. 100 Peter Iredale Rd. Hammond, Oregon. 503-861-3170 x 21. September 3 and 4 features the Labor Day Weekend BBQ & Live Music at Nehalem Bay Winery. See Anita Margarita & the Rattlesnakes and the Julie Amici Band. Free admission and family friendly. Highway 53 just outside of Nehalem. www.nehalembaywinery.com. (503) 368-WINE. September 2 - September 3. TAPA presents “The Octette Bridge Club.” Written by P.J. Barry, and directed by Brenna Sage. On alternate Friday evenings, eight sisters meet to play bridge and gossip. The first act takes place in 1934; the second ten years later during a Halloween bridge party where each acts out her costume’s persona. TAPA’s Barn Community Playhouse. 1204 Ivy St, on the corner of 12th and Ivy. Tillamook, Oregon. (503) 842-7940. September 3. Saturday Pile-Up in Lincoln City. Bring your own car for the car show, bench racing, tailgate party and jam session. 11 a.m. Lincoln Auto Supply, 2130 NE Hwy 101. Lincoln City, Oregon. September 5. Dog Swim!! at the Lincoln City Community Center pool. Bring your best friend. Well-behaved dogs of all sizes and breeds are welcome to swim in the pools before they shut down for fall maintenance. Suggested admission is a donation of dog food for the Lincoln County Animal Shelter. 4:15 p.m. Lincoln City, Oregon. 541-994-2131. September 3. Labor Day Pie and Ice Cream Social. Yachats Ladies Club pie socials are famous for their astounding variety of delicious pies. Each slice is a generous 6th of a pie and costs $4. Add a scoop of ice cream for an additional $1. A variety of beverages will also be sold. 11 a.m. Yachats Ladies Clubhouse, W 3rd & Pontiac. Yachats, Oregon.